← Summertime and the pickin’ is easy. A composed salad is edible artistry. Each fresh vegetable is showcased, each vivid color and texture contrasting beautifully together on the plate. Mix and match, whatever suits your palette. Prep Salad; Set out 4 dinner plates for the composed salad. On one side of each plate place two leaves of butter lettuce as the bowls. Mound the torn lettuce into and around the “bowls” or leaves of the butter lettuce. Heat a saucepan with salted boiling water, add the beets and cook for approximately 30 minutes until tender. Check by piercing with a sharp knife. Rinse under cold water to remove the outer skins. Let cool. Cut into 1/4 inch slices. Sear the carrots in a lightly oiled sauté pan until they brown lightly. Season with salt and freshly ground pepper. Set aside. Wash radishes thoroughly and slice into rounds. Compose salad; Divide the sliced beets and the carrots equally for four portions. On each plate fan the beets down one side and place a bunch of carrots in the middle. Add the sliced radishes next to the carrots. Prepare Shrimp Skewer; On 4 metal or wooden skewers ( soaked in water) alternately thread a total of five shrimp and pieces of onion and pepper on each. Season with salt and black pepper, baste with sweet chile sauce. Place the skewers on a pre-heated grill over medium heat. Cook for about ten minutes on each side until the shrimp and veggies are slightly charred. Baste with additional sauce while cooking. Place one skewer on each salad plate. Garnish; Garnish each plate with a dollop of your favorite prepared dressing and the croutons. 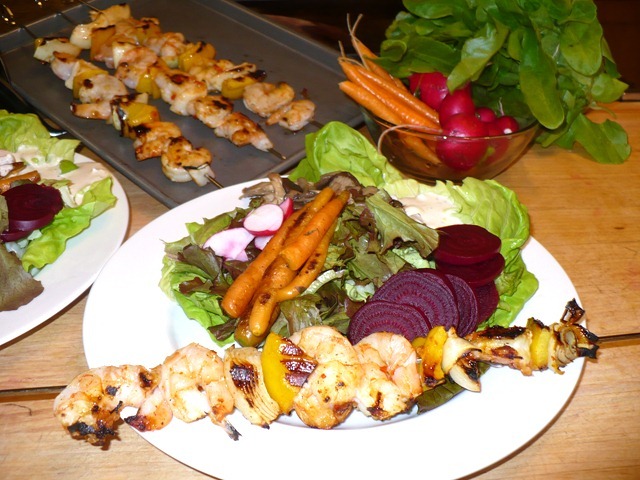 This entry was posted in Recipes, Salads & Vegetables (Ensaladas & Verduras) and tagged cook with us, healthy recipes, organic vegetables, shrimp salad. Bookmark the permalink.